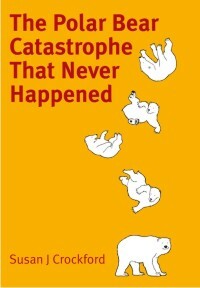 The “historical” reduction refers to in the IUCN Polar Bear Specialist Group report excerpt (copied again below, click to enlarge) was a drop from about 1,200 bears in 1987 to about 1,030 bears in 2011. What that statement doesn’t tell you is that virtually all of that decline occurred in the late 1980s/early 1990s – the population hasn’t changed appreciably in size since then (Lunn et al. 2013). The IUCN PBPSG currently lists this subpopulation as “stable,” as does Environment Canada. While Sciullo’s statement could be honest and true if the average body condition changed from “very fat” (Fig. 1) to simply “fat” (or even from “fat” to “normal”), that would not necessarily mean that the bears are currently in danger of starving or failing to reproduce.2 We’d have to see the actual data to know if the bears were in trouble – something no one has bothered to provide. Figure 1. Another photo of the very fat female discussed by Ramsay and Stirling (1988:614). Captured in July 1984, she weighed 410 kg (910 lbs) (this picture was taken before a tag was glued on her head). However, she had been captured 8 months before (November), after the disastrous winter of 1983, when she weighed only 99 kg (218 lbs). See the recent discussion at PBI. Picture taken by Ian Stirling 1984, Canadian Wildlife Service. Click to enlarge. Conclusion: Western Hudson Bay polar bear numbers are NOT currently declining and there has been NO TREND in sea ice breakup and freeze-up dates since 2001. If there has been a change in body condition of females in the fall in the last 10 years, it cannot be due to sea ice changes since 2001. An internal government report has finally been released on recent (2005-2011) WHB mark-recapture work (PDF HERE; discussed here) but it contains a population estimate only. It has no figures on changes (if any) on number of cubs, size of litters, or condition of bears over time for 1984-2011 (previous study period ended in 2004). The authors (Lunn et al. 2013:18) calculated a new estimate for the population at 2004 (previous count), using the same method they used for their new count in 2011; this generated an estimate of 742 (630-872) for 2004, vs. the 806 (653-984) estimated for 2011. This indicates that there has been no decline in population numbers since the last estimate was calculated in 2004. In addition, Lunn and colleagues (see pg 15) found no significant trend in sea ice breakup or freeze-up dates over the period 2001-2010 (using a definition of 50% ice cover, rather than polar bear-relevant definitions of 30%/10% determined by Seth Cherry and colleagues in 2013, discussed in detail here). They also acknowledged that they did not cover a significant portion of the WHB population territory in their 2005-2011 mark-recapture surveys and this likely accounted for the difference between their estimate and the one calculated from an aerial survey in 2011. As a consequence, the PBSG updated their population status table in late January 2015. They listed the WHB subpopulation estimate as “1030” and its trend as “stable,” in agreement with Environment Canada’s recent assessment. Footnote 1. 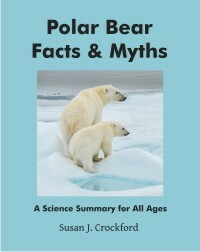 Sciullo’s supervisor is York University’s Faculty of Environmental Studies assistant professor Gregory Theimann (a former student of Andrew Derocher) who is also an IUCN Polar Bear Specialist Group (PBSG) member . Footnote 2. In order to describe the body condition of polar bears, many researchers now use a “girth” measurement (e.g. Rode et al. 2012), which replaced a relative “condition index” (e.g. Stirling et al. 1999), which replaced actual weights (e.g. Derocher et al. 1992) or a subjective condition index (“1-5”) of thinnest to fattest (e.g. Amstrup et al. 2006:998). These changes make it virtually impossible to compare body condition over time or between subpopulations. Bottom line for body condition: Derocher et al. 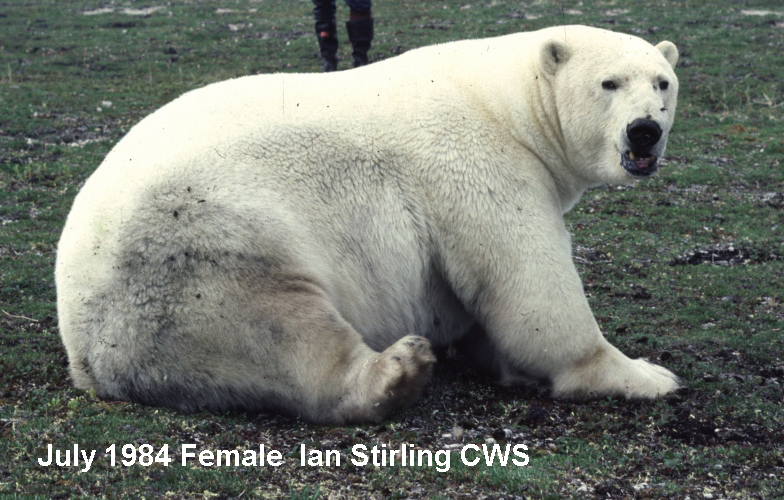 (1992:564) suggested that the critical weight for WHB females to successfully become pregnant and carry cubs to term was 189 kg (417 lbs) in the late summer. Amstrup, S.C., Stirling, I., Smith, T.S., Perham, C. and Thiemann, B.W. 2006. Recent observations of intraspecific predation and cannibalism among polar bears in the Southern Beaufort Sea. Polar Biology 29, no. 11:997–1002. Pdf here. Obbard, M.E., McDonald, T.L., Howe, E.J., Regehr, E.V. and Richardson, E.S. 2007. Polar bear population status in southern Hudson Bay, Canada. Administrative Report, U.S. Department of the Interior- U.S. Geological Survey, Reston, VA. 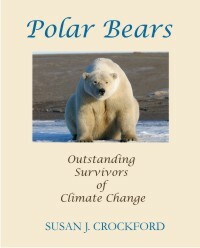 This entry was posted in Advocacy, Conservation Status, Population and tagged advocacy, body condition, climate change, Environment Canada, misinformation, PBSG, polar bear, population estimate, Sciullo, status, Tom Nightingale, vulnerable, western hudson bay, York University. Bookmark the permalink.